Two of the country’s leading transport and logistics specialists have linked together in their common goal of addressing the domestic economy’s mobility requirements. Isuzu Philippines Corporation (IPC) has leveraged its substantial resources by supplying the Interpacific Highway Transport Corporation (IHTC) with 60 units of Isuzu’s EXZ heavy-duty tractor heads. The new units, which can be configured to serve a wide range of applications, are expected to bolster the diverse operations of IHTC. 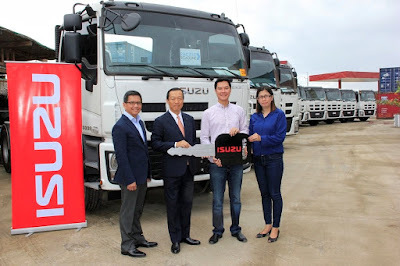 Leading the simple program that marked the delivery of the new EXZ tractor heads were IPC President Hajime Koso and Isuzu Automotive Dealership Inc. President and COO Manny Aligada, who handed over the fresh units to IHTC General Manager Gilbert Singson and IHTC Operations Manager Cherry Lacson. The turnover activity was held on January 24 at IHTC’s truck yard in Plaridel, Bulacan. “The record figures logged by the Philippine’s automotive sector in 2016 was not only fueled by private consumption but also by the robust demand for trucks and buses. This can be seen in Isuzu Philippines Corporation’s performance last year, which saw sales of medium and heavy-duty trucks and buses surge nearly 220 percent. Clearly, the truck segment is a significant contributor to the rise of the automotive industry, which in turn is an indicator of the growth currently experienced by the local economy,” Koso said in his speech during the turnover program. The IPC chief added that demand coming from premier logistics providers like IHTC is also a testament to the heightened pace in the country’s delivery of goods and services. “We are deeply honored, of course, that the Interpacific Highway Transport Corporation has placed its trust on Isuzu vehicles,” Koso said. IHTC’s transport services rely on trucks that can move cargo requiring refrigeration, bulk products in powdered and liquid forms, heavy machinery and infrastructure components, and even liquid and gas chemicals that need pressurization during transit. The company also offers spaces for container storage and a cross docking facility. With a GCM rating of 60,000 kilograms, the Isuzu EXZ is the best solution to IHTC’s varied transport requirements. The EXZ’s tractor head is ideal at powering a body that can come in several applications such as a tanker, insulated van, dumper, concrete mixer or pump, and bulk carrier, as well as in flat, low or drop bed. Besides this versatility in configuration, other advantages offered by the EXZ is the extensive aftersales services and availability of parts guaranteed by the wide network of Isuzu dealerships across the Philippines.